Severe Weather Outbreak Likely in Southeastern U.S.
Friday is a day that will feature light winds and clear skies. 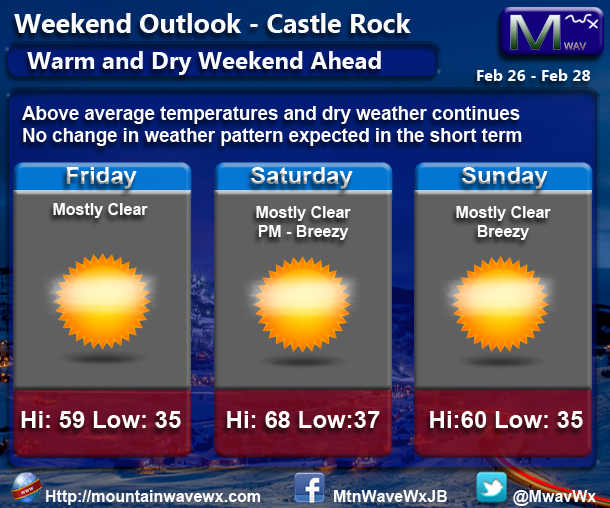 Temperatures will be pleasant near 60 for the Castle Rock area and in the low 60’s for Denver and nearby areas. Overnight temperatures will be in the mid to upper 30’s. Mostly clear skies for Saturday with temperatures generally in the upper 60’s to low 70’s. Castle Rock is currently projected to be just shy of 70, but if we get a little help from some down-sloping winds (possible in the afternoon) we could see the 70’s for many areas South of Denver. Nighttime temperatures will be in the upper 30’s to lower 40’s for most areas. Sunday will be slightly cooler but still feature well above average temperatures. Many areas will be in the lower 60’s during the day and mid to upper 30’s overnight under mostly clear skies and a bit of breezy conditions here and there.